For a contest marked by so much scandal and mudslinging leading up to the June primary, the Santa Clara County sheriff’s race seemed oddly quiet lately. But Sheriff Laurie Smith’s challenger, retired Department of Corrections chief John Hirokawa, was apparently scrambling behind the scenes this past week after missing a deadline to get his candidate statement on the fall ballot. It took two court motions and a whole lot of finger-pointing to remedy the misstep so Hirokawa’s name wouldn’t appear next to a blank box on the election booklets mailed to about 850,000 prospective voters. He pulled it off by simultaneously shifting blame on the county and tapping insiders at the same agency for help, putting one political backer especially in a tough spot. The amateur move of missing a deadline most other candidates routinely meet is another apparent misstep in a campaign that has cycled through campaign managers and struggled to find its footing since Hirokawa emerged second in a field of five candidates to challenge Smith in the general election—the first contested runoff in two decades. Rather than picking up momentum, however, Hirokawa remained on the defensive over the the involvement of his leading backer and close political ally, Deputy Sheriffs Association President Don Morrissey, in a racist texting scandal. Morrissey resigned as union head on July 26, eight weeks after the primary. The last day to submit a candidate statement to the Registrar of Voters (ROV) was Aug. 10, but Hirokawa didn’t realize he blew past the deadline until three weeks after the fact, on Aug. 31, according to his initial legal petition. “I was unaware of this requirement as I never received the candidate booklet from the ROV and due to confusion, neglect or mistake failed to recognize this was a required deadline as set forth in the primary booklet,” he wrote under penalty of perjury, which seems to contradict records showing that he signed for a copy of the guide on March 8. So Hirokawa gave it another shot. This time, however, he cast his noncompliance as more the county's fault. In a more detailed petition filed Sept. 4—just two days before the ROV sent its voter guides to the printer—the ex-undersheriff said he was “puzzled” by his statement not automatically rolling over to the runoff, blaming the county’s “unclear and confusing” rules and unnamed ROV staff for misinforming him about the process. 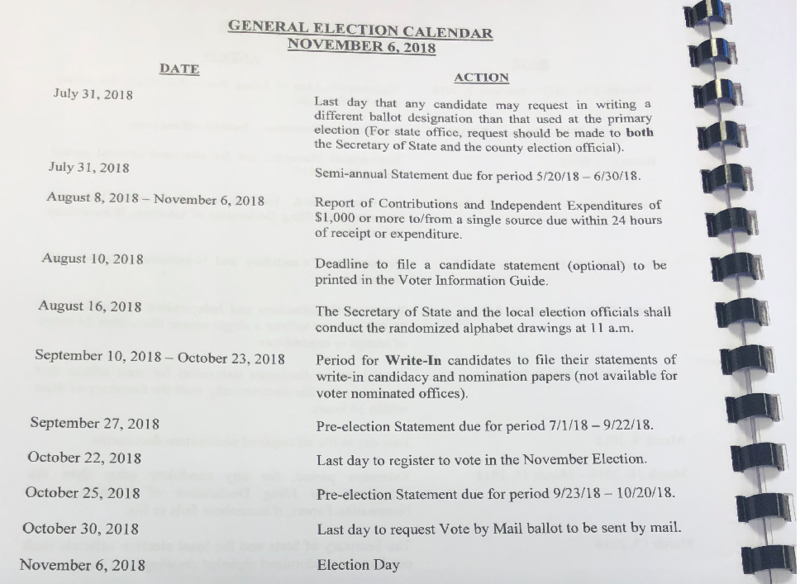 Though records show that the ROV sent a letter dated July 12 from interim Election Division Coordinator Linda Tulett to remind Hirokawa of the upcoming deadline, he said he never saw it. Again under penalty of perjury, Hirokawa stated that nothing in the candidate booklet—the one he said he didn’t obtain in time—addresses the issue of repurposing statements filed before the primary. Maybe he skipped the multiple pages in the candidate guide listing important dates to remember, including the Aug. 10 deadline in question. Four county employees helped Hirokawa salvage the situation, according to court records. On Aug. 31, he spoke to Assistant Registrar of Voters Virginia Bloom, who, in his telling, acknowledged that the rules are confusing and assured him that the county would refrain from opposing his appeal. Over the next few days, Hirokawa also emailed back and forth with County Counsel deputies Steve Mitra and Danielle Goldstein, telling them about his conversation with Bloom and his intent to challenge the ROV in court. He looped in a third county attorney, Hirokawa campaign donor Cheryl Stevens, on her private email address. The possible conflict came to light when Hirokawa attached email headers to his court filings and Smith supporters brought the email chain with Stevens to the attention of the Santa Clara County District Attorney’s office. John Chase, head of the DA’s Public Integrity Unit, contacted on Tuesday, refused to confirm or deny whether an investigation was underway into possible conflicts of interest in the counsel’s office. Stevens was not available at her office telephone number on Tuesday, but the county’s Employee Services Agency described her status as “active.” She didn’t answer multiple emails to her county and personal addresses by press time. County Counsel Legal and Compliance Officer Kim Forrester said Stevens has been out of the office since Sept. 5. That’s a day after Hirokawa’s ex parte court hearing, when he submitted copies of his email correspondence to the judge. This is a laughable article crafted by the Laurie Smith campaign machine. 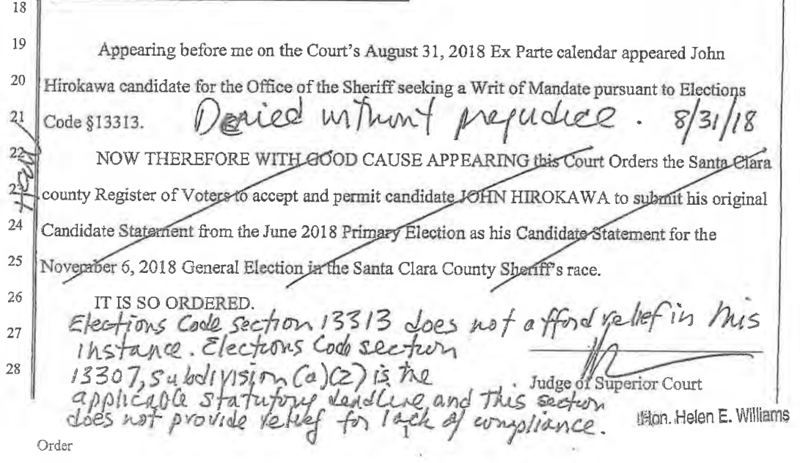 The Court, ROV, and County Counsel all were perfectly fine to let Hirokawa have his remedy to get his statement on the ballot. Not even news. No objection, or issue with fairness. Didn’t fight it in Court or make a statement. But we have another hit piece from Wadsworth! Laurie Smith thought she had an advantage, but when the door closed, she ran straight for her favorite publication of yellow journalism. The mud starts flinging, and the water gets murky. Because winning a fair campaign based on the issues is too high a mountain for Laurie Smith and her side kick Rick “Im not trusted to be the Chief of Correction” Sung. So right to the gutter they go trying to tarnish everyone else’s name, doesn’t matter who you report to in the County. This duo burns people inside and outside the Sheriff’s Office. BOS and Jeff Smith, are you OK with this behavior from your current Sheriff, Laurie Smith? Yep, Laurie Smith planned the whole thing. Very cunning on her part. Hey the guy was stupid and missed a crucial deadline. Regardless, Smith is a slimy politician whose moral compass is seriously out of whack and/or nonexistent. The position of Sheriff would be better off not served by anyone. Always someone else’s fault, lie, deny, blame Smith. Same old story. Take some responsibility for your mistake! Hello again Ms. Wadsworth! I see my earlier pleas for you to analyze fact over fiction have fallen on deaf ears. Your consistent and blatant disregard for the truth is appalling. First of all, what is the point of this so called “news story?” Are you so eager to pander to Laurie Smith that you fail to preserve any sort of dignity or professionalism? Regardless of the reasons behind Mr. Hirokawa’s “mistake,” does that automatically remove his right to due process and those afforded to him by the constitution? He won his argument in a court of law! You should (at least I would hope) respect that. Second, you want to bring up the DA’s Integrity Unit? Why don’t you ask John Chase about the Sheriff’s Office mishandling of my own alleged criminal case? I’ll save you some effort. Not only did Mr. Chase reject Laurie’s criminal complaint against me for a multitude of legal reasons, but also noted mishandling of the case due to obvious “animosity” towards me. Me, a ten year veteran who went above and beyond my assignments to help the community and the agency I loved! Is that the type of Sheriff you want in office? Laurie Smith and her goon squad are incapable of seeing past their own childish egos. If you at all care about the citizens of Santa Clara County, VOTE JOHN HIROKAWA FOR SHERIFF!!! Bizarre tirade. You might want to be checked for something like munchausen by proxy. Are you really of cop? Call it what you will. The fact of the matter is I was targeted due to a political differing opinion. I also demanded action when the Sheriff and her administration waited to arrest an accused child molestor in order to garner better press. The facts are clear! I stand behind my reputation and efforts for the community! I doubt Laurie Smith can truthfully say the same. Because I chose the people over the Sheriff herself, I was discarded. Demanding loyalty over morality and ethics sounds akin to another political office we are all familiar with! Hey “Just A Reader?” Do you even know what Münchausen syndrome is!?! You sound ignorant, but I’d expect nothing less from a Laurie supporter. Next time do some research before trying to belittle someone using a serious clinical ailment you clearly know nothing about! I actually don’t get it either. The letter linked in the article states congratulations that your name is on the ballot and if you want to change something do it by this deadline. I would too have assumed everything is in order and good to go. No wonder the registrar of voters in santa clara county has such a bad reputation. Great job, Jennifer. Something really stinks here. I am wondering if Stevens drafted the court documents Hirokawa submitted in the hearings, and if any of that was done while on county time. Hirokawa seems to have access to the county counsels office that the average county resident does not enjoy. The board of supervisors need to fully investigate the relationship between Stevens and Hirokawa. “Just A Reader”……You’re an idiot! Your comment is not helpful. If he cannot competently file documents in a timely manner, how can he competently run the Sheriff’s office? Shifting blame is not helpful. It just makes one look untrustworthy and irresponsible. How much did this unavoidable mistake cost the tax payers in terms of lawyers and county employees’ time? How ’bout this: I agree with everybody! Hi, I want your vote. Dog ate my homework. I cried for a do-over. Is this a person that deserves office? How does “I missed the deadline” usually work in court? Missing an important and extremely simple deadline like this for the ballot appears to indicate very poor execution and lousy attention to detail. How on earth could he run the sheriff’s department with such bad management and planning? Sounds like neither candidate is a good choice. You have got to be kidding me!!! This looks like Judge shopping!!! Shame on you Theodore Zayner…. This is a play from ole Persky’s book…. Please watch Public Comment from Thursdays FGOC meeting regarding the Management Audit of the Registrar of Voters office in Santa Clara County. Another prime example of our corrupt legal system here in Santa Clara County. Is this THE Scott Largent!?! The One and only Mr. Largent who demands truth and accountability from our elected officials. At least….. that’s what you used to be. Now you seem to follow Laurie Smith like a lost puppy! How much did your loyalty cost I wonder?